At its simplest a hand gun sight is a set of markers formed by rugged metal parts. These sights, also known as iron sights, are built into the hand gun and do not require any additional purchase. Laser sights are a very popular handgun modification. A laser sight is a small, usually visible-light laser placed on the handgun and aligned to emit a beam parallel to the barrel. The laser light is a small dot and appears that way even at long distances. This modification however does not allow for gravity effecting the bullet, wind speed or distance between the beam and the axis of the barrel, or target mobility while the bullet travels. 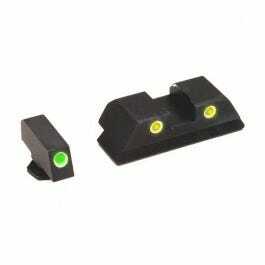 Laser sights are very popular among civilian and law enforcement agencies. Telescopic sights although more expensive or an optical sight that are very much used with precision hunting and target shooting. The telescopic sight is an optical telescope that offers visibility and resolution at a range that would not be possible with eye sight alone. Telescopic sights are very popular with revolvers but can also be mounted on semi-automatic hand guns and other firearms. The telescope is mounted above the barrel and requires additional accessories to be mounted with. One of the most popular sights for hand guns is an optical device known as a reflector sight or reflex sight. The reflex sights allow the user to look through a partially reflecting glass and see an illuminated projection of an aiming point. These sights are mounted on top of the barrel at the rear of the gun.